We’ve been helping Bupa this month get more people off their arses and on to their feet – supporting the brand’s Global Challenge. According to Bupa’s own research, just walking an additional fifteen minutes a day can extend your life by up to three years. Quite an incentive to dig out a pair of trainers. But let’s face it: talking about walking isn’t all that exciting. So we needed to inject a bit of excitement to bring it to life. 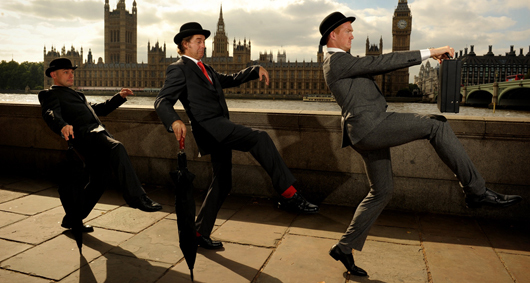 We took inspiration from the iconic Monty Python sketch that featured a certain silly walk and decided to create a walk with a difference. With the help of some Bupa boffins and some time in the Lab, we created the most calorie-busting and muscle toning walk we could muster. Then we got Olympic gold medallist Greg Rutherford to put the walk through its paces across Westminster Bridge. Accompanied by over very own Nicola and Gav, Greg appeared on Sky Sunrise, Sky Sports, LBC, Capital and Sky News Radio … all before 9.00 am. The icing on the cake though was an 8 minute piece on ITV’s Alan Titchmarsh Show that afternoon. Lovely stuff.